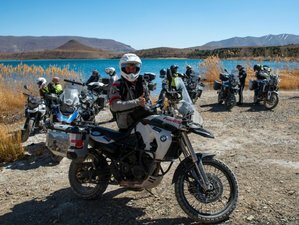 This exciting Atlas and desert motorcycle tour is a perfect opportunity for riders to explore the architecture, culture, and gastronomy of Morocco. Enjoy touring with an expert trilingual guide and a like-minded group, as you pass by the various cultural and natural wonders across Morocco. Enjoy a unique experience in a Desert Bivouac. During the tour, you will visit some amazing places that Morocco has to offer, including the little blue town of Chefchaouen, Essaouira, and Marrakech. Accommodation will be in a double room at various high-quality hotels and riads. The meeting point for the tour will be in Málaga Hotel, Spain. You can either show up at the location with your own bike or, if you are arriving by plane, train, or bus, MotoRentour will arrange transfer from the airport, train, or bus station (Málaga). For those who are renting a bike, they will assign you your bike and you will be able to go for a short introductory ride to get accustomed to it. In the evening, you will meet for a welcome dinner and there will be an introductory briefing about the format of the tour. The group will discuss in detail the route of day two. Every night, you will have a briefing for the next day. Today, you will have an early breakfast, load all the luggage and gear on your bike, and start the journey. Get ready to ride through the coast from Málaga to Tarifa, where you will take the ferry to Morocco. After the customs formalities in Tanger, you will head out to your first destination in Morocco, the little blue town of Chefchaouen, set in the Rif Mountain area. Enjoy dinner in the city center, where you will be able to walk around and discover all the narrow little streets in the Medina. Early in the morning, you will ride towards Fez. The terrain is perfect for motorcycles and it offers a fantastic atmosphere in which you will taste sheer driving on a scenic route with little traffic. Narrow roads, lots of animals to watch out for. Behind the Rif Mountains, you will reach the vibrant city of Fez, the first of the imperial cities of Morocco. You will have a stop in Fez. Expect a long day with impressive scenery. You will reach the high plains of Central Morocco, where the vastness and beauty of this country emerge while on the horizon the first foothills of the High Atlas appear. You will pass Ifrane, also known as the Switzerland of Morocco, and head to Midelt, where you will rest for the night. Enjoy dinner in the hotel. Today, you will pass the first crossing of the High Atlas Mountains, heading towards Imilchil. It is a small town in Midelt Province, located at an elevation of 2119 meters in the valley of Assif Melloul ("White River"). After a quick break in Imilchil, you will head to Todgha Gorge. It is a canyon in the eastern part of the High Atlas Mountains in Morocco, near the town of Tinerhir, where you will stop for the night and have dinner in the hotel. Get ready for an early breakfast and ride to Dadès Gorges, which offer a spectacular scenic route formed by a series of rugged wadi gorges carved out by the Dadès River in the Atlas. After a stop on top of the Dades Gorges, you will continue your journey towards Ouarzazate, while enjoying the view of the Atlas on your right. Head north in the direction of Marrakech. About 35 kilometers / 22 miles out of the city of Ouarzazate, you will find the Ksar (fortified town) of Ait Ben Haddou, a well-known UNESCO World Heritage site. From here, you will pass the Atlas through the Tizi n'Tichka Mountain Pass at 2260 meters to Marrakech. The landscapes are magnificent and you will have a great pleasure winding on these marvelous mountain roads. Enjoy dinner in the hotel. After breakfast, you will head out to the Atlantic. The route today will be short and fast. You will reach Essaouira, where you will have enjoy your well-earned rest day. Your four-star hotel is located in the heart of the Medina. The group will have dinner in the village fish market, prepare yourself for a delicious fresh fish meal. In this first stage of your return, the group will head northbound towards the imperial city of Rabat, the capital of Morocco. The trip runs along by coast along quiet roads, miles of glorious sands peppered with small fishing villages, historic ports, and fortified towns. Today, you will ride towards Tangier to catch your ferry ride back to Europe. Once in Spain, the group will head out to Málaga. Enjoy your breakfast in the hotel. Say goodbye to your fellow travelers, hoping that this tour will be an unforgettable experience and remain a long and pleasant memory for all participants. Please note that there is no guarantee about weather conditions; overnight destinations and meal plans can be changed. Your motorcycle tour will start and end in Málaga, Spain. This trip will take you from Spain to Morroco: Chefchaouen, Fez, Midelt, Imilchil, Ouarzazate, Tinerhir, the valleys of Dades, Ait Benhaddou, Tizi n'Tichka, Marrakech, Essaouira, and Rabat. You will be served daily breakfast, lunch, and dinner with non-alcoholic drinks. The pillion is available for an additional charge of Eur 1,100. Single room is available for an additional charge of Eur 300.